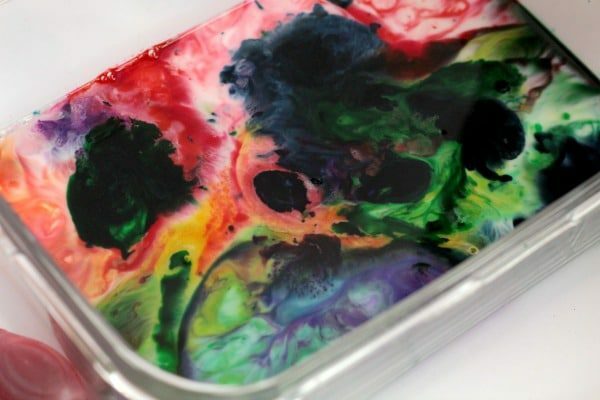 Preschoolers will love this amazing science demonstration on surface tension! 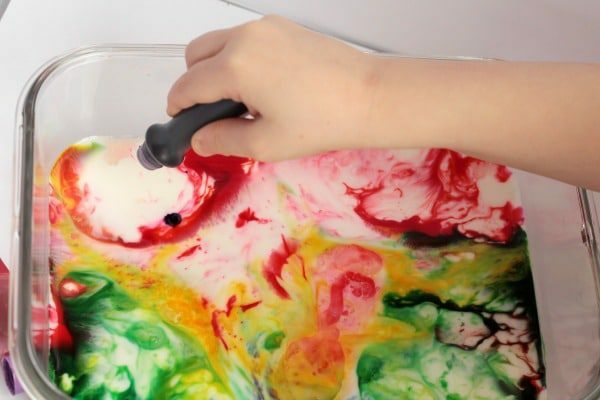 This magic milk rainbow science experiment is perfect for little scientists. We’ve done the milk surface tension science experiment for kids before, but I’ve never done it with Bo. 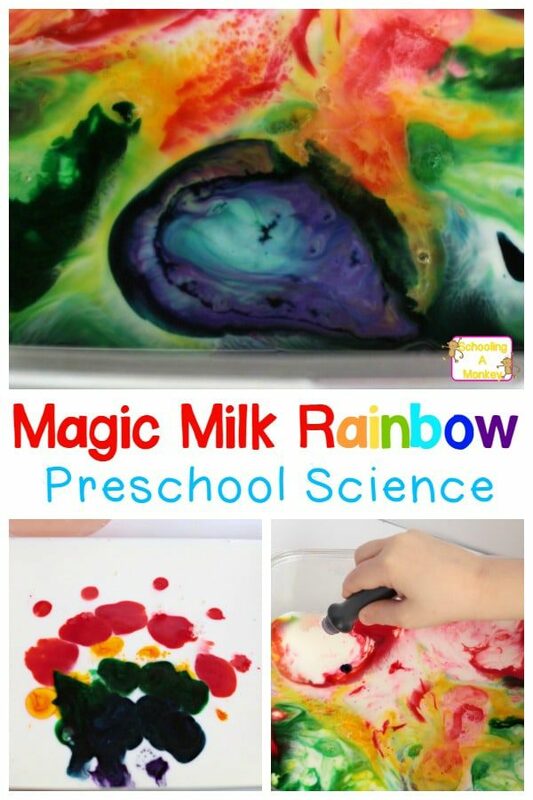 She absolutely loved this magic milk rainbow science experiment! She wanted to keep trying it over and over again until we ran out of milk (and almost ran out of food coloring). This science demonstration and St. Patrick’s Day STEM activity is a hit with kids of all ages, but preschoolers will especially love it. 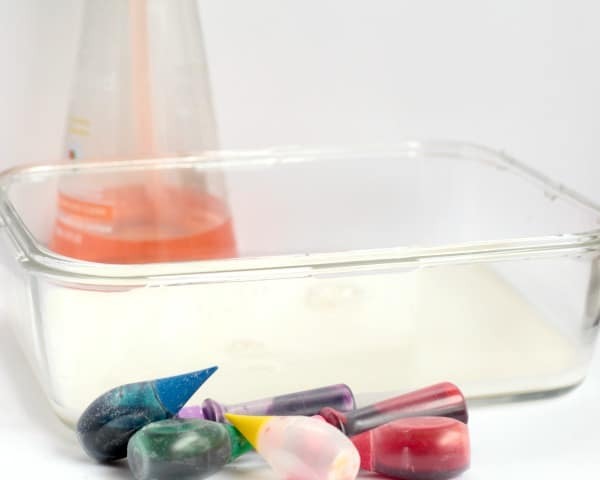 This quick science experiment is the perfect easy science experiment for preschoolers (and for adults short on time). Disclaimer: This post contains affiliate links at no cost to you for your convenience. First, cover the bottom of your container with about 1/2 an inch of milk. You don’t need tons of milk to get this to work. We used about a cup total. 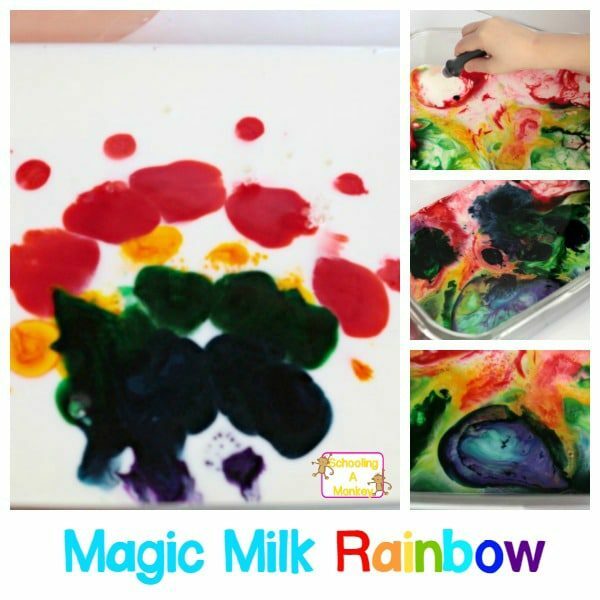 Next, drop a few drops of food coloring in a rainbow pattern on the milk. The color will spread a little, but not much. Instruct your preschooler to drop a tiny bit of dish soap onto each spot of color. The results are immidate and spectacular. Suddenly, the color flies all over the place! 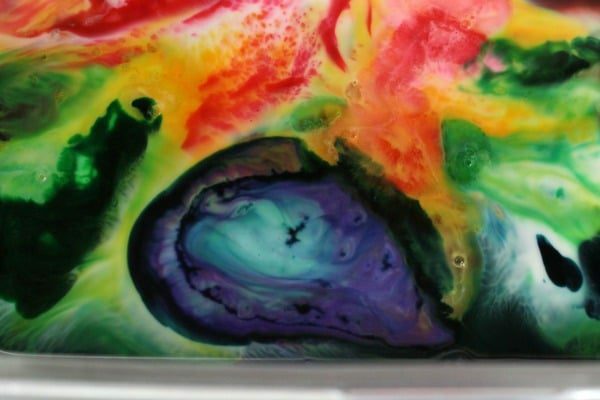 Bo kept adding more color and dish soap until the milk turned completely purple. The results of this science experiment are so dramatic due to the effects of the oil in the milk (the fat) and the soap. Milk is a non-polar molecule and won’t dissolve in water. When soap is added to the milk, it allows the fat to be carried through the water (which is why we use soap to clean dishes). 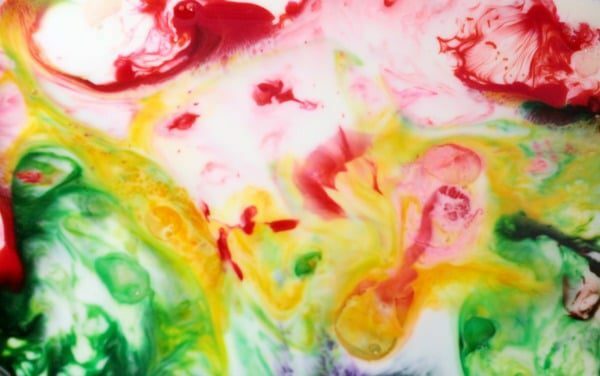 When the soap is dropped into the milk, the soap and fat molecules combine, which causes the food coloring to move rapidly through the milk, creating pretty, swirling patterns. 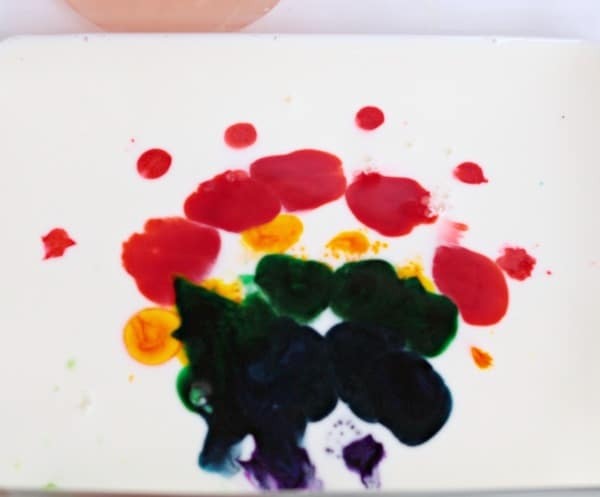 You could even use this experiment to learn about color mixing if you choose colors that mix well together! 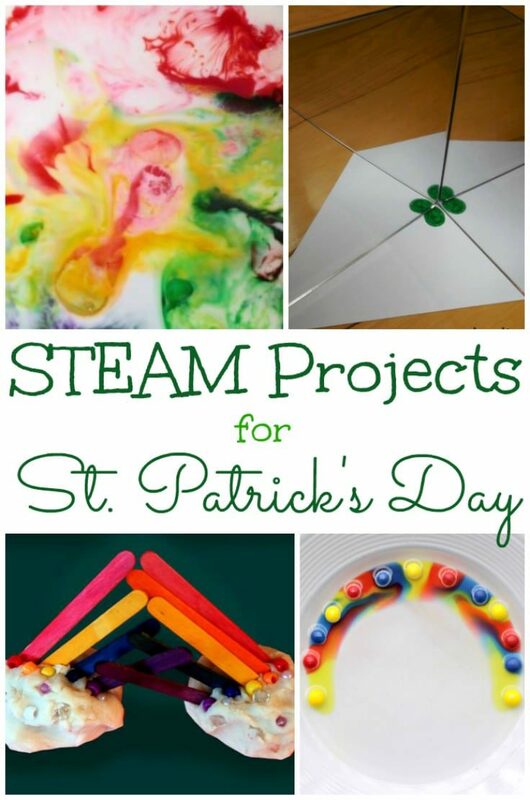 More Fun St. Patrick’s Day STEAM Projects!